Wotcha, lids, lidettes and even your young lidls. 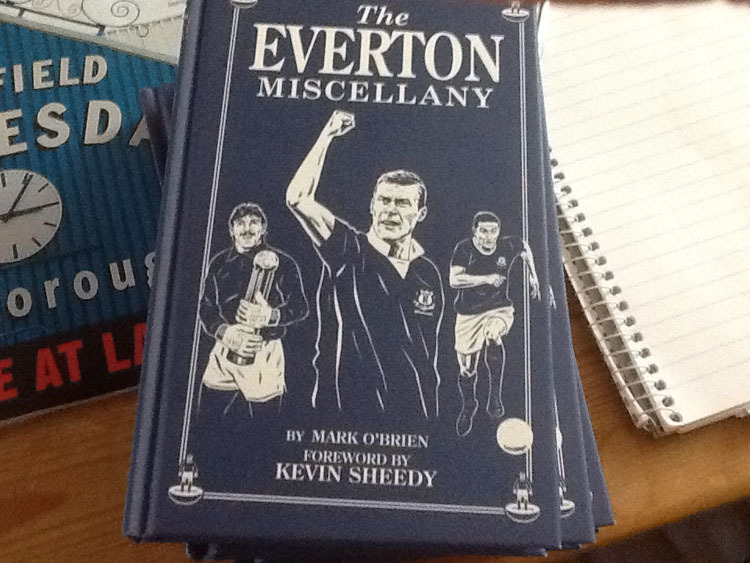 We have three copies of the 2012 updated edition of the Everton Miscellany to give away. If you want it as a ‘stocking filler’ for someone then you can even have it signed and a message in it for them – before you get too excited though, it will be by the writer and and not Kevin Sheedy. If you still want to enter, just send an email to markobrien1971@yahoo.co.uk with ‘competition’ in the subject header. We could pose some pointless question but we are all old enough and wise enough to cut to the chase and accept that the winners will be picked at random instead. Competition closes at 5pm on Friday. Don’t be a nuisance and email after that. Posted on October 19, 2012 February 2, 2014 by mob1971	This entry was posted in Uncategorized and tagged Books, competition, Everton Miscellany, Kevin Sheedy. Bookmark the permalink. They are a chain. I saw one in Vegas and had exactly the same reaction. Only a crippling hangover prevented me taking a wacky photo.